I LOVE shopping...it's my confession. Alas, I don't have enough money to spend on full price items. Tiffany's is one of my favorites jewelry stores to window shop. The diamonds sparkle and call my name, "Tiffany, get a loan! I will make your fingers look so pretty!" That darn store is SO expensive, but isn't it fun to dream. My real shopping consists of planning and fun research! The number one question that people ask me is "where do you find those good deals?" Honestly, finding deals consists of social media and emails. Research is the key! Start following your favorite stores. You will be surprised at the number of sales you will find!However, the best deals always and I repeat always come off season. People don't normally want to buy a coat in summer, but stores must move the inventory to hold next winter's products, which means cheap deals. I know waiting to buy your favorite blouse is hard, but you can save oodles through patience. Below is my favorite Daily Deal. 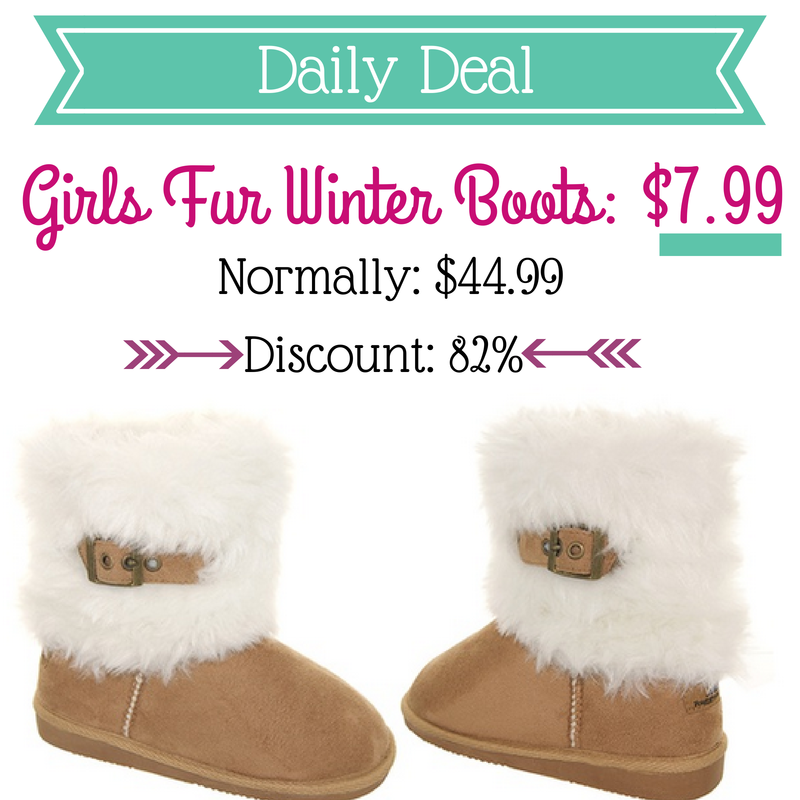 If your daughter is in need of new boots, right now is an awesome time to stock up on winter essentials. Wish these came in a smaller size for my baby - cannot get enough of these cute boots! Happy Off -Season Shopping! Thank you for following me on Twitter! I am going to have to check out these boots for my 2 year old. I always say I'm going to buy clothes in the opposite season so they are at the best prices, but I always forget! Thanks so much for the reminder! No problem and hope the boots work for your little girl! Thanks for visiting! I know they are adorable! Thanks for stopping by! Great points! Sometimes you can "get lucky" and find good deals, but a lot of times you have to search for them. I'm 28 weeks pregnant with a girl, so I enjoy seeing these deals!